Khalid Shafar is a designer based in Dubai. While working in marketing and communications, he completed an interior design degree in 2005. Four years later, Shafar left marketing to study furniture and object design at Central Saint Martins in London and at the Centre for Fine Woodworking in New Zealand. Shafar has collaborated with a number of renowned international firms. In 2010 he worked with the Brazilian Campana Brothers to make an installation for Abu Dhabi Art, and recently partnered with French cabinetmaker Moissonnier and carpet industry leader Tai Ping to create limited-edition releases. Shafar opened his own Dubai studio in 2011 and inaugurated his first showcase space, KASA, the following year. His works have been featured in international design publications, including ELITE Russia,ELLE Decor Japan, and Lifestyle Journal Hong Kong. Khalid Shafar recalled his fond memories of the desert landscape and its flora to create a sleek, innovative design line that echoes the aesthetic of the palm tree. Fallen Palm, a unique bench, represents palm trunks that have fallen as a result of advanced years or damage from storms. 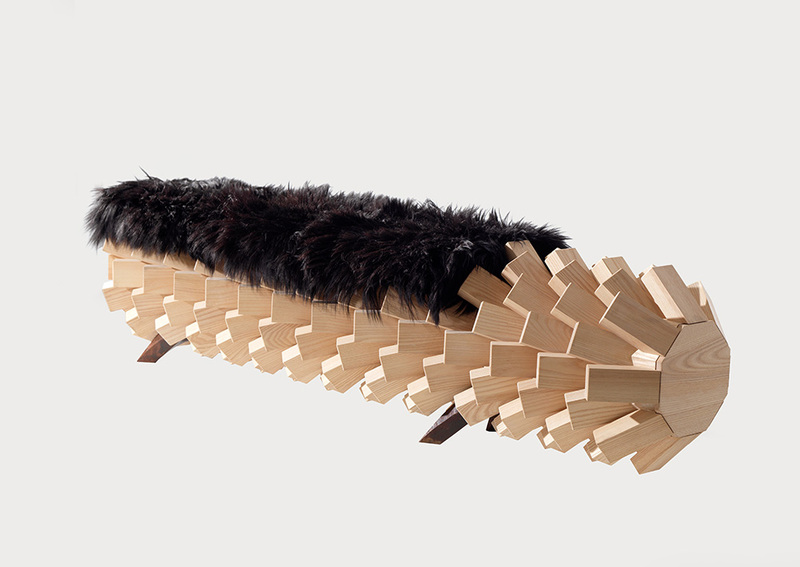 The bench features a cushion upholstered with goat hair and drawers concealed in each end for storing small objects. Shafar thoughtfully included spaces between the wooden fronds for magazines to be displayed. Date palms historically played a significant role in Bedouin life. Their trunks supported the roofs of mudbrick towers; their dried leaves formed wall partitions and provided shade; and their fibers were used to make ropes, baskets, and mats.